It’s little secret that I’m a landscape photographer first and that every other genre comes second. At the air show last weekend, our host made an offer to meet us at the air field at 6am. Sunrise light can be magic so I jumped at the opportunity. What surprised me most is that only 2 or 3 other photographers in the group made the effort to show up at that time. Too often, photographers look to the subject first and only give a casual though to the light. I liked this scene because it tells a story. The F-22 Raptor parked next this aircraft was “in the open” and I took several photographs of it. Initially, I walked past this one initially because of the clutter around the plane. After having some time to start sorting images, of all the images I took that morning, I kept coming back to this one. At least to me, it’ll always represent a fond memory of some magic light, on a very pretty morning, at the air show. As a subtle reminder that we’re at war, the bottom of stop sign in the frame reads: “Use of deadly force is authorized.” The kind men with the M4 rifles made sure that you didn’t get too close or approach the aircraft from the “wrong” angle with your camera. 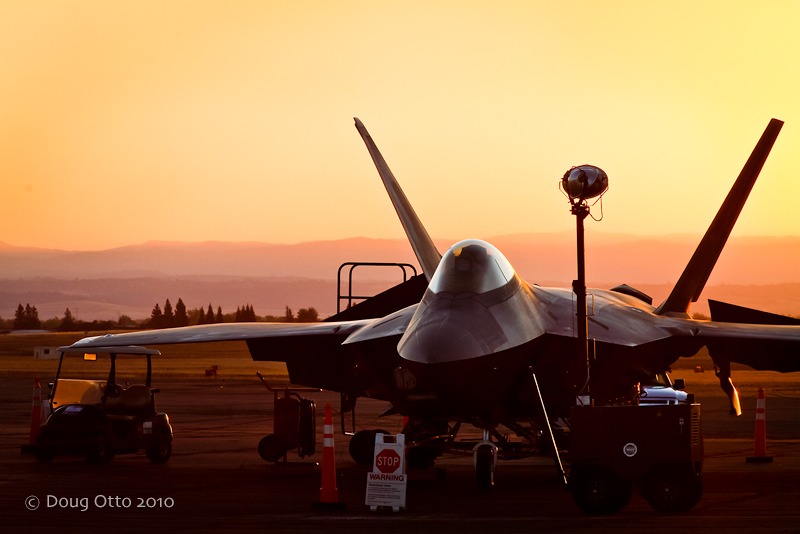 This entry was posted in Photography and tagged california capital airshow, Canon 100-400, Canon 7D, doug otto, F-22 Raptor, Photography, Sunrise. Bookmark the permalink.